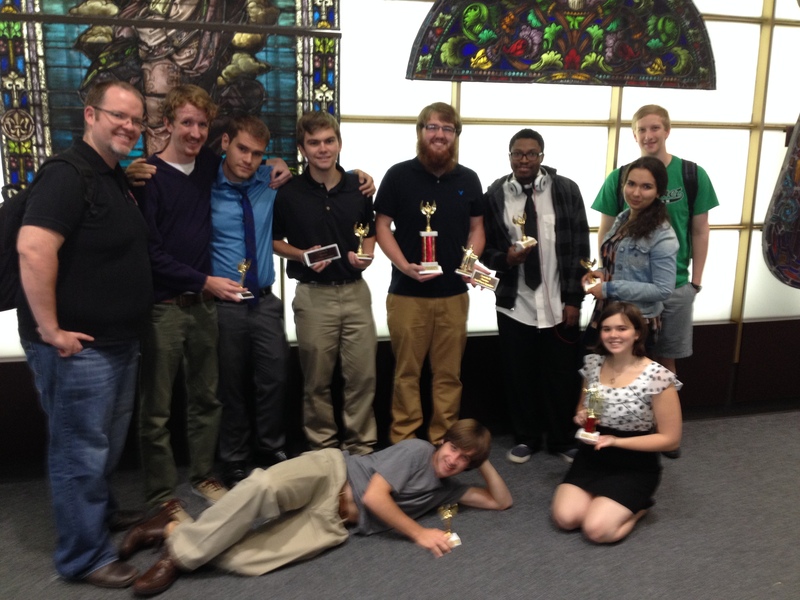 McKendree Takes 2nd Place at Loyola University and Southwest Baptist University! 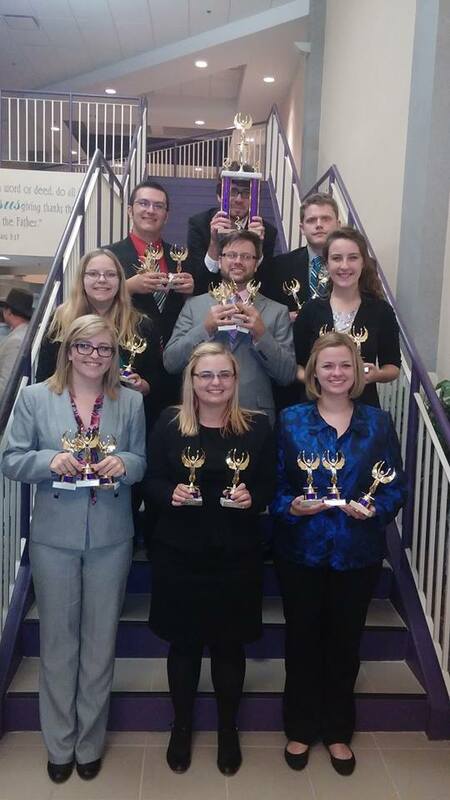 The McKendree University Speech and Debate team took 2nd place at tournaments on consecutive weekends, taking home 18 individual awards. Back: Joe Blasdel, Quinn McRoberts, Trent Boyer, Alex Baldwin, Gage Simmons, Rodney McBride, Mary Makarishcheva, Brent Nicholson. Six colleges and universities attended Loyola University’s debate tournament, including Appalachian State University, Missouri Western State University and Cedarville University, on Sept. 26-28. Representing McKendree were senior Trent Boyer; junior Quinn McRoberts; sophomores Mary Makarishcheva and Rodney McBride; and first-years Alex Baldwin, Beth Graham, David Junge and Gage Simmons. At the first half, in the open division, the team of Makarishcheva and McBride, as well as the team of Boyer and McRoberts, went 3-1 and finished as quarterfinalists. In the novice division, the team of Baldwin and Simmons posted a 4-0 record, winning both the semifinal and final round, to finish as novice champions. The team of Graham and Junge went 3-1 and finished as semifinalists. Graham won top novice speaker, while Simmons took 4th place. At the second half, the team of Makarishcheva and McBride and the team of Baldwin and Simmons each went 4-1, finishing as quarterfinalists. Boyer and McRoberts, as well as Graham and Junge, went 3-2 to finish as octofinalists. Baldwin won top novice speaker, while Simmons took 2nd place. Front: Hannah Zickefoose, Emeri Farnam, Katie Reining. Middle: Taylor Rossi, Spencer Marcum, Rebecca Blake. Back: Briar North, Caleb Vines, Josh Fleming. Eleven colleges and universities attended Southwest Baptist University’s speech tournament, including Bowling Green State University, the University of Central Missouri and Cameron University, on Oct. 4. Representing McKendree were seniors Rebecca Blake, Josh Fleming, Spencer Marcum and Caleb Vines; sophomores Katie Reining and Taylor Rossi; and first-years Emeri Farnam, Briar North and Hannah Zickefoose. Marcum won 1st place in programmed oral interpretation, 2nd place in drama, 3rd place in prose, 4th place in poetry and 4th place in individual sweepstakes. Reining took 1st place in informative speaking and 2nd place in informative speaking. Blake finished in 3rd place in after dinner speaking and 6th place in drama, while winning 5th place with Fleming in duo. Fleming also took 4th place in programmed oral interpretation. Emeri Farnam and Hannah Zickefoose finished in 4th place in duo and were the top novices in the event. Zickefoose was also the top novice in programmed oral interpretation. North won 5th place in drama and top novice, while also finishing in 6th place in informative speaking. Rossi took 6th place in persuasive speaking. McKendree will next compete in debate at its home tournament on Oct. 17-19 and in speech at the University of Central Missouri on Oct. 18-19.